NEW YORK CITY, N.Y., Aug. 11, 2011 (SEND2PRESS NEWSWIRE) — EaseUS Software, a leading provider of data backup and disaster recovery and storage management solutions for Windows environments, today announces the general availability of EaseUS Todo Backup 3.0. The new release of EaseUS Todo Backup Advanced Server simplifies the backup task to protect SQL & Exchange Server. Differential backup is now available as well. Built upon EaseUS’ data protection technology, the new and upgraded version, EaseUS Todo Backup 3.0, offers an all-in-one and cost-effective solution to backup and protect the data, system and database. More new functions such as differential backup, backup to tape, and one-click system backup are added to achieve a comprehensive backup and recovery process – and assure that all critical information is well protected. The updated EaseUS Todo Backup Free comes with the new features, and becomes the only free comprehensive backup software offered with both incremental and differential backup. * One-click system backup and recovery. * One-click system recovery to dissimilar hardware. * Exchange/SQL Server backup and recovery to protect database. * Differential backup to only backup changed files since last full backup. * Backup & clone dynamic volume. * Back up to tape devices. * Install program without system rebooting. EaseUS Todo Backup Free for home and business users is available at: http://www.todo-backup.com/products/home/free-backup-software.htm . EaseUS Todo Backup Workstation for $39 is available at: http://www.todo-backup.com/business/workstation-backup.htm . 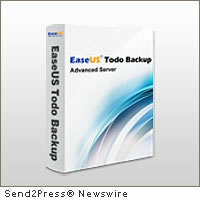 New EaseUS Todo Backup Advanced Server for $299 is available at: http://www.todo-backup.com/business/advanced-server-backup.htm . EaseUS Todo Backup Technician at a discounted price only for $799.20 (was $999) is available at: http://www.todo-backup.com/business/technician-backup.htm . The company specializes in backup software, partition manager and data recovery for Windows OS. Its major products are EaseUS Todo Backup, EaseUS Partition Master and Data Recovery Wizard. For more information, please visit http://www.easeus.com . EaseUS® is a registered trademark of CHENGDU Yiwo Tech Development Co., Ltd.
– RSS News feed for EaseUS: https://send2pressnewswire.com/author/easeus-software/feed . Original Keywords: EaseUS Todo Backup 3, disaster recovery, storage management solutions, protect, SQL and Exchange Server, data protection technology, differential backup, database, dbase, CHENGDU Yiwo Tech Development EaseUS Software New York City New York NEW YORK CITY, N.Y.
REFERENCES: Business News, EaseUS Todo Backup 3, disaster recovery, storage management solutions, protect, SQL and Exchange Server, data protection technology, differential backup, database, dbase, CHENGDU Yiwo Tech Development EaseUS Software New York City New York NEW YORK CITY, N.Y.